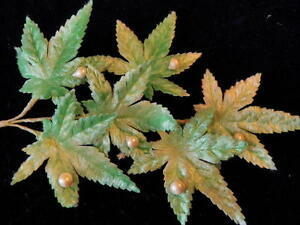 What a charming bunch of six velvet 1 1/2" leaves, each accented with one petite 1/8" "pearl"! These leaves were created in Japan many many years ago are in very good condition. 5 stars! Fantastic communication! Great items! A true pleasure to work with! 5 stars all the way! FAST ship! Great items! Thank you!!! Velvet leaves are beautiful.Seller is reliable.Very happy!